This time my shawl design was actually inspired by the hand-dyed, light and lofty yarn I purchased from an indie dyer in Scotland. 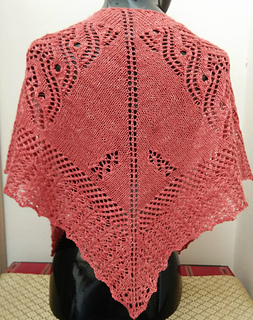 It’s a 4-ply baby alpaca, silk, and linen blend in a semi-solid strawberry color (coral, to my eye). It spoke to me of flight and this pattern that’s meant to resemble the wings of a bird took shape! I hope you enjoy knitting this as much as I enjoyed creating it.